Metamorphosis in biology means the process of transformation from an immature form to an adult form in two or more distinct stages. Good examples are insects and amphibians. Life for most insects begins as a larva or nymph then progresses to the pupa stage and ends as an adult. There are two main types of metamorphosis in insects: simple metamorphosis or hemimetabolism, and complete metamorphosis or holometabolism. Insects who go through simple (or incomplete) metamorphosis have three life stages. These insects start as eggs, which are usually very small. When the egg hatches, a larva or nymph comes out. Nymphs are just baby insects. Most of the time, the nymph looks similar to the adult, but it is smaller, may have different colouration, and does not have wings. The nymph grows through stages called instars, shedding its 'skin' (epicuticle) at each stage (ecdysis). Finally, it changes into a mature adult with wings. Some insect nymphs are aquatic, which means they live in water. These nymphs usually have gills and look very different from the adults they will turn into. Nymphs that live in water are called naiads. Insects that have complete metamorphosis have four life stages. These insects start as eggs, which are very small. The egg hatches and a larva comes out. The larva looks like a worm and eats and eats so that it can grow much bigger. When the larva has grown it changes into a pupa. The pupa usually can not move or eat. The pupa is a special time when the insect is changing into an adult that will look very different from the larva or the pupa. Moth pupae (plural of pupa) are inside cocoons. When the pupa opens, the adult insect comes out. The monarch butterfly goes through four stages of development. Life for a monarch butterfly begins as an egg hatched from an adult. This egg then develops into a worm-like larva caterpillar. In the pupa or chrysalis stage, the caterpillar spins a silk pad on a twig or leaves and hangs from this pad by its last pair of prolegs. It hangs upside down in the shape of a "J" and then molts leaving it encased in a green exoskeleton. The mature butterfly emerges after about two weeks and feeds on a variety of flowers including milkweed flowers, red clover and goldenrod. In typical amphibian development, eggs are laid in water and larvae are adapted to an aquatic lifestyle. Frogs, toads, and newts all hatch from the egg as larvae with external gills. 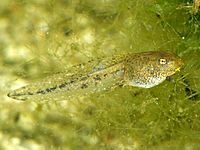 Afterwards, newt larvae start a predatory lifestyle, while tadpoles mostly scrape food off surfaces with their horny tooth ridges. Many marine species have evolved a system where they release their eggs and sperm into the water at the same time, and fertilisation takes place in the sea over one or two days. This increases their chance of reproductive success. Then, larvae join the other plankton, eating and growing before metamorphosing into adults. Most marine invertebrates and many fish have a life cycle with pelagic larvae or even pelagic eggs. These have the capacity to be transported long distances, and so spread the species around to other places. The need for metamorphosis is clear when the relative size of eggs and adults is understood. A mature Atlantic cod can reach two metres long, and weigh over 200 pounds (96 kgm). The female will produce over 100,000 eggs in a single spawning, and the resulting larvae are quite tiny. There is no way they could live like the adults, which are more or less top predators. The larvae cannot even swim against the current. Therefore they must live a different kind of life before they can live as the adults do. Their development is packaged into stages, and each stage has adaptations to life at its stage. The sharp distinction between stages (best seen in insects) is presumably because a longer transition would leave the juvenile less fit, either at its younger or older ways of life. Metamorphosis Facts for Kids. Kiddle Encyclopedia.